Venue: Ouse St Arts Club, Newcastle-Upon-Tyne, UK. Richard is a singer-painter from Newcastle. He's released four albums of songs, most recently the critically-acclaimed The Glass Trunk, as well as a number of electronic works under the pseudonym Eyeballs, composed extensively for film and theatre, and performed his intense, shamanistic folk art all over the world. For Arborescent, Richard invited audience members to compose a musical score by selecting and placing bastardised ping-pong balls in three fish tanks full of water. Yvette Hawkins is a visual artist working across installation, sculpture, drawing and artist's books. Her work reflects an interest in the exploration of measurement, time and the limitations and capabilities of the body as an instrument to explore the visible and invisible world. Yvette graduated from Newcastle University in 2007 and has since continued to work in the region, exhibiting within the UK and Europe. For Arborescent, Yvette created a large wall drawing which explored mark making through duration and light. ‘Un/Fold’ followed a rigid system of physically folding and unfolding gridlines from a single sheet of paper, to create a skewed, imbalanced tessellated paper sculpture where light seeped beneath the creases to create new marks, shadows and lines. Mawson Kerr was formed in 2010 by Will Mawson and Dan Kerr, Newcastle based architects who have designed and delivered a variety of award winning buildings. A dynamic studio with over 15 years experience Mawson Kerr deliver bespoke architectural designs catering for a variety of public and private client requirements; with experience in various sectors including, residential, education, sustainabilty, commercial, heritage, cultural, civic, leisure and health. ‘Tunnel Vision’ plays on the themes of light, shadow and texture in an enclosed space. It takes the audience on an underground journey through a Victorian tunnel, previously used for coal transportation and a mass bomb shelter, producing a disorientating and eerie piece. Sean Cotterill is a Newcastle-based musician working in the fields of performance, improvisation and composition. Working using Violin, Mixed Electronics, Electric Guitar and Amplified objects, he works in projects with a wide scope of musical material and influences, such as Red Pools, Captcha, Mutual Process, The Midnight Doctors and often in bespoke 'one time only' ensembles of local improvisers. Sean is currently working on a BA Music degree at Newcastle University and is co-running a monthly experimental night at Bar Loco, Blue Rinse. John Pope is a bassist, composer and improviser based in the North East of England. His work draws on a life long immersion in jazz, funk and rock music, filtered through the cracked vessel of free improvisation. John uses double bass, bass guitar, dictaphones and electronics to make spontaneous music, both as a shamanistic solo performer and an ensemble member. He has performed and recorded with artists from across the contemporary music spectrum and is currently studying towards a PhD is post-vernacular improvisation. Mariam Rezaei is a composer, performer and improviser and works primarily with multiple turntables, piano, vocals and electronics. Mariam leads turntable ensemble, NOISESTRA, is part of Wax Magnetic with Posset, Empty Set with Rhodri Davies, Neil Davidson and Dmitiria Lazaridou and Music Director with theatre companies Zendeh and Curious Monkey. She was awarded Best Newcomer 2012 at the Journal Culture Awards, April 2013 and is working on solo release, Lion's Blood, for touring in 2014. 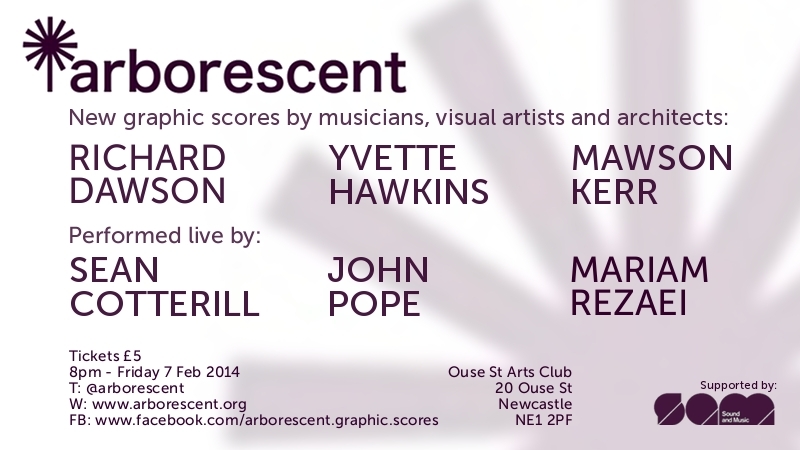 Arborescent_02 was supported by Sound and Music, and hosted by XSite architecture at Ouse St Arts Club. Arborescent 03 video now online here.